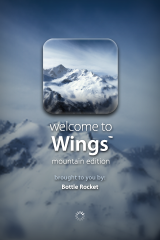 Wings is a very simple flight simulator for the iPhone and iPod Touch. When you first open the app there are 4 icons in the corners and 4 icons that represent the 4 seasons across the bottom center. The icon in the top left tells you the developer’s name, Bottle Rocket. The bottom left is a little speaker that controls the audio track being played or allows you to stop the music. Most of the music is calm and relaxing. The top right is an info screen that shows you a menu choices of Other Apps, Feedback, Share and Help. Finally, in the bottom right, you can choose from floating or flying. Flying is a quicker responding options where floating is slower. The four icons across the bottom change the sceenery through the different weather seasons. The Leaf represents Fall, Snowflake – Winter, Flower – Spring and Sun – Summer. Flying is pretty simple, you just tilt the iPhone the way you want to go. It doesn’t seem like you can crash. Anytime I hit anything it just vibrates and keeps going. Overall this application is more for relaxing than being over technical like typical flight simulators. You review this and not X-Plane? How come?